Finally, pumpkin pie ice cream sandwiches! I say finally because there were long overdue. I was planning to make them around Thanksgiving but finally got around to them last week. I made a custard base of equal parts whole milk and heavy cream, regular sugar, brown sugar, and a few egg yolks. Then I added pumpkin puree and pumpkin pie spices. I used canned pumpkin puree from Trader Joe’s but next time I think i’ll make my own kabocha puree for yummier results. I wanted the sandwiching cookies to taste a bit like graham crackers. I made a chewy sugar cookie base and added vanilla, cinnamon and honey. Oh, and I also substituted 1/4 cup of wheat flour for all-purpose flour. I scooped the dough with an ice cream scooper for size consistency (all hope would be lost if I tried to make same-sized balls with a spoon) then dipped one side in turbinado sugar and baked them sugar side up. Man these cookies were bomb! I totally underestimated the potential of American sugar cookies. 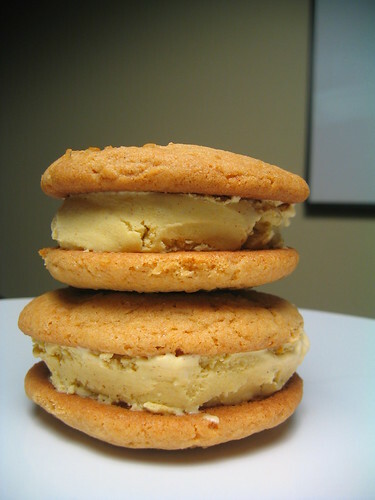 Now sandwich the pumpkin pie ice cream between two graham sugar cookies and you got yourself a nice sweet treat. These look great! I’m sure they taste great too. Ice cream sandwiches for breakfast anyway? I don’t like pumpkin but this sounds amazing! hi hannah, glad i told you to stop by and pick one up! or else they would have been sitting in my fridge. “yoony’s drive thru” – i have two more. anyone else want to stop by for one? I want one! I love pumpkin too! These ice-cream sandwiches are cute. Now I just need to buy you kitty cookie cutters and then you can make even cuter ones! and murder justin so i can be there for you to help pick up (and eat) the pieces.